Runaway Bride Start (Individuals) – Chase your way to the finish! Everyone’s encouraged to come dressed in their wedding best* Or, feel free to rock our fancy tux shirt or white branded ladies tee. Tied the Knot Tethered Partner Race (Pairs) – Couples or friends will be tethered together and run the 5k in stride. Finishers in this group receive special prize.. This group begins with the second Runaway Bride Wave. Team Challenge (Groups 3+) – Sign up as a team for fun or to fundraise for your favorite charity! VIP Lounge Access Enjoy access to an exclusive VIP area including special seating a mimosa bar and snacks, directly adjacent to the post-race reception in the Lobby of Hotel Covington! Awards will be determined by the criteria to the right. Prizes courtesy of our awesome sponsors! Largest team – Team organizer earns a super fun prize from one of our great sponsors! Top male/female Awards – Awarded by chip time. Fastest tethered pair – As determined by finish crossing. Best Costume (Individual) – As voted by the crowd! Best Costume (Group/pair) – As voted by the crowd! Bubbly! - Each participant receives a complimentary glass of champagne or bourbon cocktail! Parking will be available in the garage behind Hotel Covington, and validation is available at The Madison. 2019 Great Bridal Chase Course. Click to Enlarge! Chip timing – Know your speed with our chip timing feature. 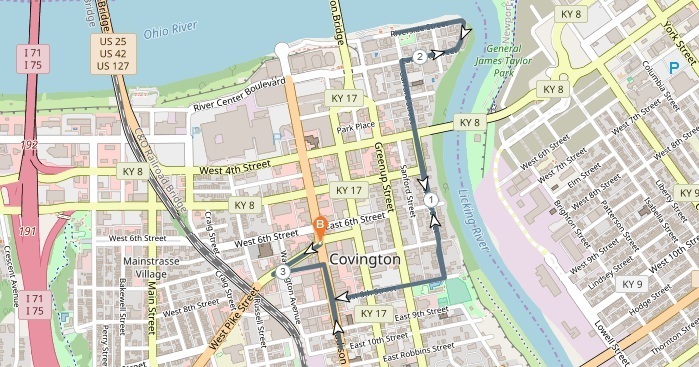 1) Loop around Duveneck Square towards 7th St.
2) Head east on 7th street towards Madison Ave.
3) Turn right (south) on Madison Ave.
5) Turn right (east) on 8th St.
6) Turn left (north) on Garrard St.
7) Turn right (east) on 2nd St.
8) Continue down 2nd to Shelby St.
9) Loop down Riverside Dr.
10) Continue East on Riverside Dr.
12) Turn Right on Shelby st.
14) Turn right (west) on E. 8th St.